Asian Pears are normally a thing to be enjoyed by themselves...fresh and crisp. However it's getting to be that time of year when everything is dipped, dashed and drenched in caramel (one of my favorite things!). 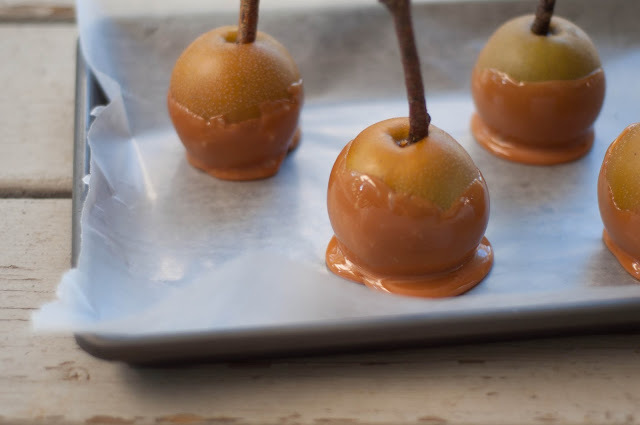 So why not stray from the standard caramel apple and surprise (and impress) all of your friends and family with Caramel Covered Asian Pears! 1 bag of caramel candies, unwrapped (Note: you don't need to use the whole bag) and WARNING: I consumed probably upwards of 20 little candies during this process. They're addicting! Melt the caramel in a double boiler. 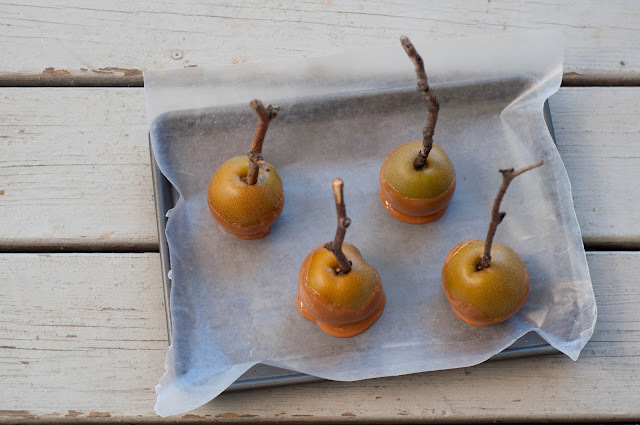 While that's melting place the sticks in washed and completely dry (caramel won't stick if the pear is wet). When caramel is ready dip the pears and let them set on the baking sheet. So easy! And yummy too!